Inflatable water slides are without a doubt a wonderful toy for kids from all ages and even for the occasional adult who wants to bring back childhood moments. A lot of people visit water parks to get the full water slide experience, but there isn’t a need to go out to get all the water slide fun. You can pick up an inflatable waterslide at your favorite store or rent it from your party supply rental, for a reasonable price! This is one of the most popular water slides for kids. 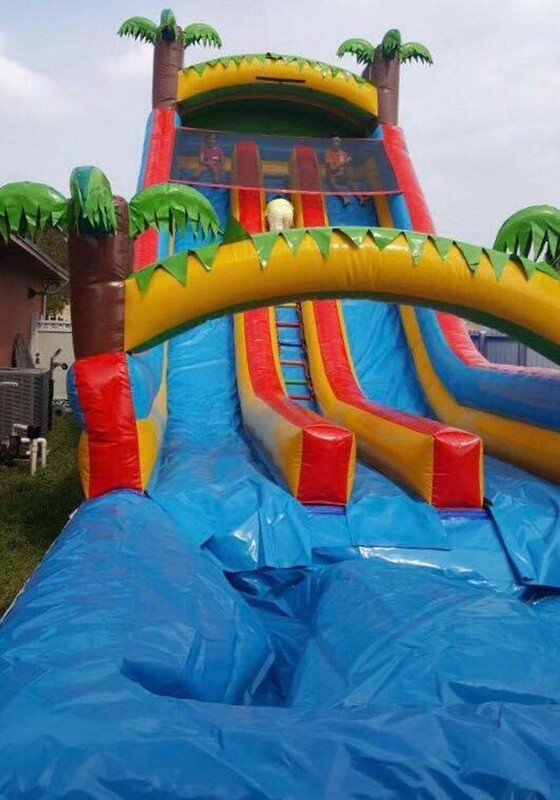 You can place this 24' FT enormous slide in your backyard without any trouble. Your kids will have all the fun climbing wall in order to get to the top of the mountain to slide back into one soothing water splash. The beautiful shiny colors of this inflatable will brighten up your kids’ days as it will provide them a nice work out .You can find this toy at Nicky Party Rentals for around $399.00 dollars! Races can’t get any more fun! With this top rated inflatable water slide kids will be able to slide through its 20 foot long lane while getting their feet and body splashed by water. This Water Slide has a slide that continues on a slip and slide! It’s recommended for children from 5 and up. You can find this item at Party rentals Miami. You can easily set this beauty up in your backyard, just make sure you have plenty of space before getting it! Now let’s look at other bounce house slides you can buy yourself! You can every kid’s dream come true buy buying or renting this amazing inflatable water PARK, as it has different features that will guaranty all kinds of entertainment for the little ones. A basketball hoop is integrated in the slide to enjoy a little water basketball! If your kid has explorer skills, this water slide is also perfect for them, as it also has a mysterious tunnel. Also it has a pool are for your kids to entertain during hot weather days. The coolest thing about Bounceland Island Water Park is that can be used with or without water, even the pool area can be use as a playground! This item costs around $530 dollars, but I’m pretty sure you can rent it for a lower fee at your rental supply store! Your children will have a blast in their own private little island. This crocodile shaped inflatable water slide, has two integrated slides and a climbing wall, for them to climb, slide and dive in for hours. Blast Zone Crocodile Isle is made out of nontoxic materials that will keep the fun safe. You can get it for 650 dollars. Throw a pool party for your kids and their friends with the Pirate Bay Water Slide. Boost your kids’ imagination as they pretend to be pirates in the wide open sea. This gigantic slide features a slide with an enormous splash area, a crawling tunnel where kids can impersonate one on one pirate fights. The little ones can jump their way at the bounce house space which has see through windows for parental supervision! Also, it has two water canyons. This slide can be yours for 550 dollars. These are the hottest inflatable water slides in the market, and the reviews show that. Make your kids afternoon or birthday party a memorable time by renting or purchasing one of them. Just remember to review all the possible toy stores and rentals to find the best deals. Good luck in your inflatable water slide hunt!